The Invasion From Planet Wrestletopia came to So Wizard by way of the creators. We were given a free digital copy of the first issue along with the script for the second. Right off the top it was intriguing with some great art and bold fonts. A classic comic feel emanates from the cover page. I feel a small disclaimer is necessary before we really get into it. I am not really a fan of pro wrestling. Given the content and the obvious care the writer put into the world of wrestling, wrestling fans will get more out of this title. 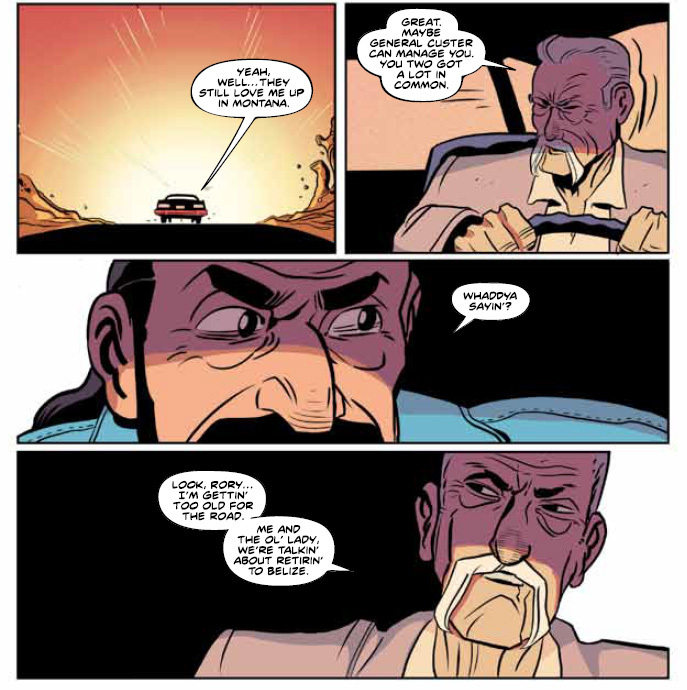 Through a couple time jumps the comic book follows a pro-wrestler named Rory. Rory is every bit the showman but also the heel. The heel in the wrestling world is there to take hits, play the part of the bad guy, make the guys the marketing team wants to promote shine. Rory feels his time is due to stop being the heel to get his own career to the next level. When he’s disappointed and passed over once again Rory takes his showmanship to the next level. He fashions a new wrestling belt and declares himself Galactic Champion of the Universe. It’s this declaration that Wrestletopia picks up fifteen years later as the signal travels through space. The very crazy declaration that did nothing good for Rory in his prime, but will certainly impact his future. The wrestling world is ripe for parody. It would have been pretty easy to make the comic non stop punchlines about the extreme world of professional wrestling. The creators of Wrestletopia were obviously aware of this but also obviously fans. They treat the subject matter with respect and love. The core story is extreme but the character development is familiar. It feels real, as crazy as that may sound. The quote “To anyone who’s ever taken a bump, done a job or left color on the canvas for our entertainment – this is for you” leads the title page. Along with this touching sentiment for the crazy performers who put on the brutal sport for mass entertainment are the credits. Each of he creators is given a pro-wrestling-esque nickname. Ed “the Carnage Artist” Kuehnel & “Masculine” Matt Entin wrote the book. Dan “the Body” Schkade did the art. Colors are credited to Marissa Louise AKA “Col. Von Slamstein.” Lettering is credited to A Larger World Studios (The North Hollywood Nightmares). “Hangwoman” Mariah Huehner did the editing and Fred “DrShoNoLuv” Chao did the design. The art is top notch. The page layouts as a whole down to each individual panel. The book was self published and looks every bit as good as any major label. The style, implied motion, and coloring give the book a warm feel that reminds you of cartoons you enjoyed as a kid. Since the story is told through flashbacks and in the past the visual tones of the book set the tone inside the reader. Even looking through the issue for the third time while doing this write up I find myself scrolling taking it all in. The writers also did a great job keeping the story moving on every page. Levity, story progression, and exposition blend well to keep the flow of the story. One element of the writing never falls out of balance with the others making the read choppy. The only complaint with the writing is in a stray curse word or two. The premise, the subject matter, and 99% of the book are kid friendly. Not kid oriented exactly but Saturday morning cartoon level kid friendly. Replacing the sparse harsher curses with something a little softer seems like an obvious move to keep that going for younger readers. The oversized first issue does a good job setting the stage. We get to know the main character and potentially a couple of the ongoing side players. We get enough backstory to start the adventure. By the end of the book where the hook is supposed to come in it doesn’t really latch on to the reader. It’s an interesting premise and there is some allusion to what’s coming for Rory but we don’t really get a taste. The second issue we got for this write up was still in the script stages. This was actually a pretty cool way to continue. While the visuals are absolutely nice seeing the strength of the writing in black and white (sorry) provided a peek behind the curtain. My slight let down at how the first book ended softly wasn’t repaired early on in the second issue. We are given more back stories through a whole new time setting. While more backstory to flesh out Rory as a man isn’t a bad thing the placement seems off. Especially when looked at in the mindset of a younger reader growing up in the instant gratification pop culture world we have. Even as an older reader, one who was 100% committed to these first two issues I felt like the story was ready to really start in earnest but was being withheld. Invasion from Planet Wrestletopia is a funny concept. It’s definitely a fresh idea for a series and the talent behind the book is strong. While this particular title didn’t land with me fully it wouldn’t be fair to say it’s bad. It isn’t bad. With a bit of polish and continued dedication from the staff I wouldn’t be surprised to learn they find their audience. I know a few people specifically I think would get a kick out of something so self aware and fun. Invasion from Planet Wrestletopia issue #1 and #2 are on sale now! Issue #1 is available on Amazon Kindle and paperback, iBooks, Comixology and ComixCentral! Issue #2 is currently available on Amazon Kindle and ComixCentral. Other SKUs coming soon! Preview issue #1 here on Tumblr. Preview issue #2 here on Tumblr.